Evidence for Democracy has released a report titled "Can Scientists Speak? Grading communication policies for federal government scientists". Government media policies do not support open and timely communication between scientists and journalists. Policies do not protect scientists’ right to free speech. Policies do not protect against political interference in science communication. Over 85% of departments assessed received a grade of C or lower. All but one department scored lower than the United States average in 2013. The Department of National Defence took the first place spot for open communication. 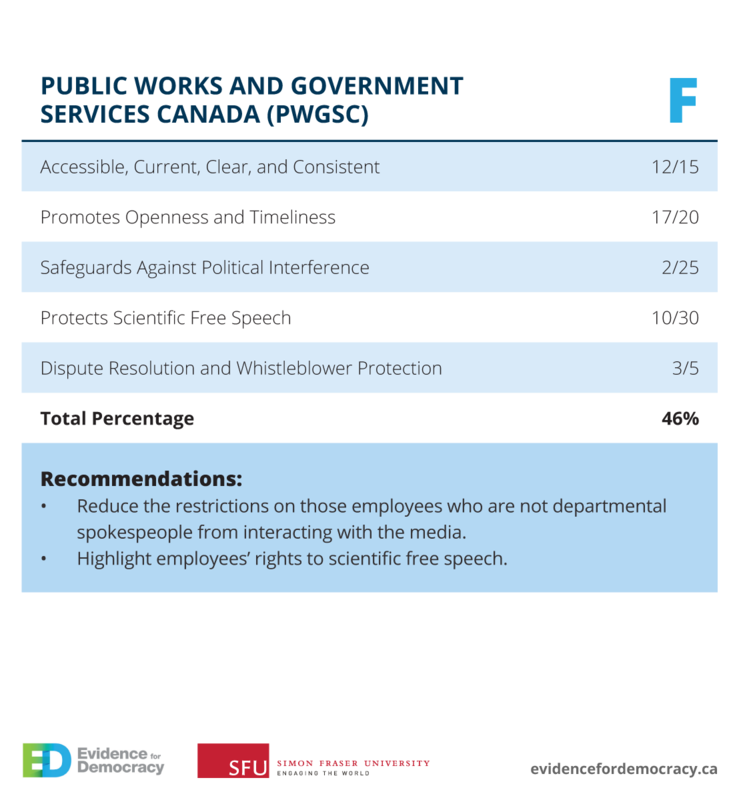 The Canadian Space Agency, Public Works and Government Services, Industry Canada and Natural Resources Canada were tied for last place with failing grades. "Our findings are concerning because current media policies could prevent taxpayer-funded scientists from sharing their expertise with the public on important issues from drug safety to climate change. This information is essential for people to see how science is used in government decision-making, and thus be able to hold the government accountable," says E4D’s Executive Director Dr. Katie Gibbs, an author on the report. Federal government scientists play an important role by providing expertise that Canadians and politicians rely on to ensure the safety of our food, air, water, and environment. However, in recent years, federal scientists have been reporting severe restrictions on their ability to communicate freely and openly. This report is the first to examine this serious issue from a policy perspective in Canada, as communications policies dictate how scientists are able to communicate with journalists and the public. The report provides detailed report cards on each agency, breaking down scores into five key areas: Current and accessible communications policies, open and timely access to scientists, political interference, personal-views exceptions (rights to free speech), and dispute resolution/whistleblower protections. The report also compares Canadian department scores to those of U.S. agencies in 2008 and 2013 (graded by the Union of Concerned Scientists). Including provisions to protect whistleblowers and effectively resolve disputes. To read the Detailed Methods, please click here. Note: The Treasury Board of Canada Secretariat policies were used to assess Agriculture and Agri-Food Canada, Canadian Nuclear Safety Commission, and Transport Canada due to the absence of media policies for these departments.